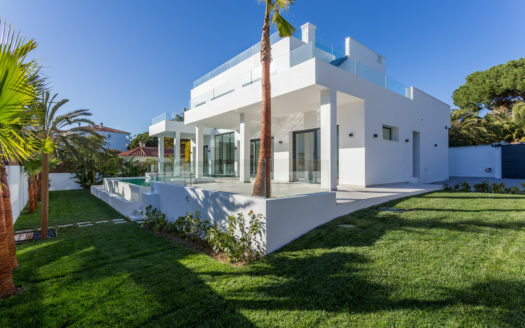 This beautifully designed Andalucía style villa sits in the highly sought after area of beachside Guadalmina, the home of numerous famous faces. The 6 bedroom property was built in 2000 and is 800m² built and is wrapped in over 2,000m² of the most idyllic landscaped garden which has complete privacy. The property has a number of unique features and designs including a secret door to the kitchen, underground cinema, hydraulic car lift to your underground parking for 8 cars, a floating glass floor and a grand fire place to name just a few. The size and distribution of this property makes it incredibly unique and the landscaped garden and use of outside space makes this property extremely special with huge potential to further its design features. For the size and location this property is being offered at a price to sell. If you are looking for size, outdoor space and only minutes walk to your beach look no further, viewings are a must.